Kanye West has had a busy weekend. On Thursday (5/16), he played a private show at Roseland for Adult Swim where he performed a few new songs. He also, as is his wont, let loose one of his stream-of-conscious rants, this time mostly about celebrity culture. You can watch video of that below. One of the songs Kanye performed at Roseland was new track “New Slaves.” A video for that song made its debut on Friday night (5/17), projected at, according to maps on Kanye’s website, 66 locations around the world. Nine of them were in NYC, including two in Williamsburg: one being outside the Bedford Ave L stop, and the second on the Wythe Hotel, and there’s video of the former below. 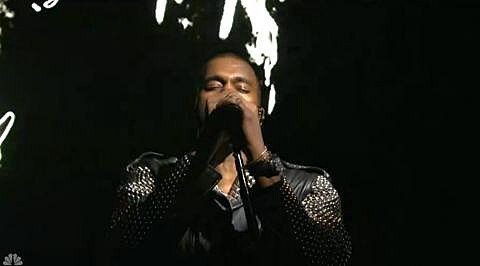 The song, which features a sample of 1969 single “Gyöngyhajú lány” by Hungarian rock band Omega and vocals from Frank Ocean, will feature on Kanye’s follow-up to 2010’s My Dark Twisted Fantasy which is, according to Pitchfork, titled Yeezus and has appearances from Daft Punk, Skrillex and more. This activity was all centered around Kanye’s appearance on Saturday Night Live‘s season finale hosted by Ben Afleck. (The teaser videos are below.) He performed “New Slaves” and debuted another new song, “Black Skinhead,” and video of those, along with the other clips mentioned in this post, are below.